This simple and beautiful recipe for Grilled Prawns depends for its appetising flavour and herby freshness entirely on Chermoula sauce – a marinade originated in Morocco which I find pleasantly close to my Pakistani tastebuds. Abundance of fresh vegetables and fruits, generous use of herbs and frequent appearance of seafood, as the main source of animal protein, are some of the dominant features of food from the Mediterranean region. These are the very features that lured me into learning to cook recipes from this cuisine as my husband and I decided to make healthier food choices a few years back. Now we are not the sort of people who go crazy counting calories before and after eating each meal or go for fad diets and bland medicinal ingredients. The food has to taste good and the meal time has to be enjoyable! Mediterranean recipes deliver each time! Chermoula is a rich blend of herbs and spices which especially pairs well with seafood. There are different versions with slight variation in ingredients. Some recipes omit onion, cayenne pepper or lemon. The marinade packs a punch of flavour and is so aromatic that even people who avoid seafood for it’s typical fishy smell can enjoy eating without hesitation. It tastes equally great with chicken, game birds and vegetables. These herbilicious grilled prawns would make a lovely starter for any meal or you can serve them with Hummus , lemony onion tomato salad and toasted pita for a complete and satisfying meal. The recipe is easy to half for a single serving or double for a family meal. Now you can either finely chop coriander and garlic and mix them in a bowl with other ingredients. Pound together all the herbs and dry spices till blended, then add lemon juice, olive oil and saffron. Simply add everything in a food processor and pulse briefly till combined. Save the remaining Chermoula to serve on the side as a dip or brush the grilled prawns with it right before serving. Preheat the grill to medium hot. Thread the prawns on skewers, piercing once near the tail and once near the head. Lightly brush the grill with oil. Grill prawns for 2-3 minutes on each side or till they change colour to pink. Serve hot with the remaining Chermoula, fresh tomato and cucumber salad, hummus and pita bread. Tip: for a simple Moroccan Tomato and Cucumber Salad, mix diced tomatoes, cucumbers, onions and chopped parsley in a bowl. Season with ground toasted cumin, salt and pepper. Drizzle lemon juice and olive oil, toss to mix. Serves 4 for starter, 2 for maincourse. Love this bright, fresh prawns dish, especially with the salad! I can double it to make for me and my husband–I know he will also love it! Looks fabulous Maria. Chermoula marinated seafood is just the best. A wonderful starter for one or for a group! Although I could happily eat the whole lot myself! 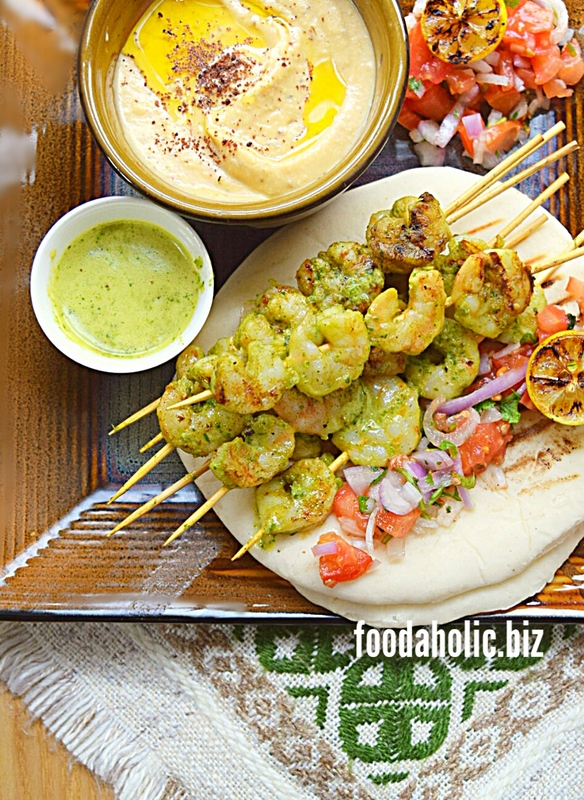 The presentation in the picture consistently aligns with your Mediterranean theme, Maria! I live in a Greek neighborhood, so am a fan of this kind of.